Class for the basic properties of materials in an elastoplastic continuum, with strain yield limit based on Von Mises yield. Get the elastic yield modulus. Get the plastic yield modulus. Set the plastic flow rate. Get the Young E elastic modulus, in Pa (N/m^2). Get the Young v ratio, as v=-transverse_strain/axial_strain. Get bulk modulus (increase of pressure for decrease of volume), in Pa.
Computes Elasticity matrix and stores the value in this->StressStrainMatrix Note: is performed every time you change a material parameter. Set the Rayleigh mass-proportional damping factor alpha, to build damping R as R=alpha*M + beta*K.
Set the Rayleigh mass-proportional damping factor alpha, in R=alpha*M + beta*K.
Set the Rayleigh stiffness-proportional damping factor beta, to build damping R as R=alpha*M + beta*K.
Set the Rayleigh stiffness-proportional damping factor beta, in R=alpha*M + beta*K.
Set the density of the material, in kg/m^2. Get the density of the material, in kg/m^2. Create a continuum isotropic elastoplastic material, where you can define also plastic and elastic max. stress (yield limits for transition elastic->plastic and plastic->fracture). Compute plastic strain flow (flow derivative dE_plast/dt) from strain, according to VonMises strain yield theory. Correct the strain-stress by enforcing that elastic stress must remain on the yield surface, computing a plastic flow to be added to plastic strain while integrating. Set the elastic yield modulus as the maximum VonMises equivalent strain that can be withstood by material before starting plastic flow. 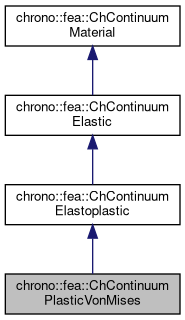 It defines the transition elastic->plastic. The lower the value, the slower the plastic flow during dynamic simulations. Set the plastic yield modulus as the maximum VonMises equivalent strain that can be withstood by material before fracture. It defines the transition plastic->fracture. Generated on Wed Apr 17 2019 09:51:46 for Project Chrono by 1.8.9 .